I baked these gorgeous Saffron Buns for St. Lucy Day, which is tomorrow! Saint Lucia (or Saint Lucy) is a symbol of hope and light in dark times. In Sweden, St. Lucia marks the beginning of the Christmas season and it all starts with a young girl crowned with fresh greens and lit candles. Guess what she is carrying? Right! 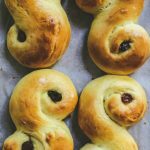 A delicious tray filled with these spectacular spiral buns! The saffron buns are not too sweet and are soft and fluffy from the eggs and butter. 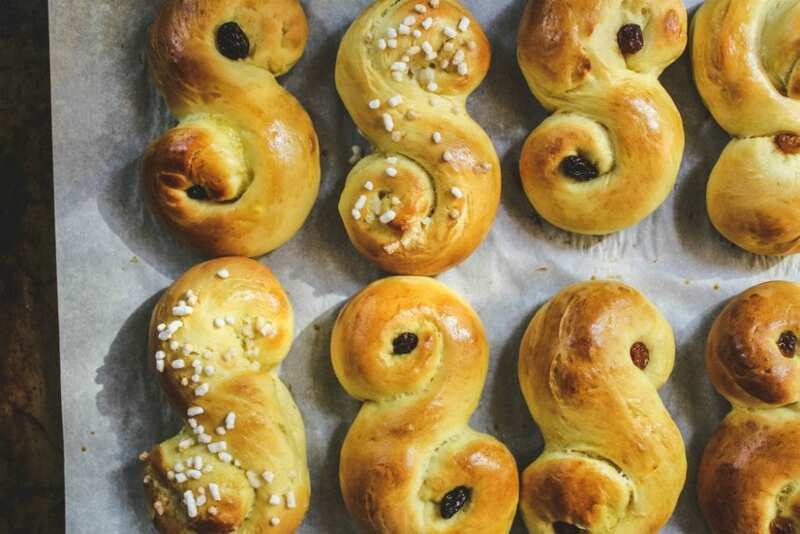 The name Lussekatter means “Lucia’s cats” and it’s because the spiral shape sort of resembles a cat’s tail. I had a chance to study in France during part of my university studies. There were students there from all over the world. It was on December 13th in the South of France that I learned about Saint Lucia. The Swedish students there announced that we should all meet in the courtyard to see their procession. I wasn’t sure what to expect and it was amazing to see all these fair haired beauties come out one after the other dressed in white gowns with a red sash tied around their waists. We moved into the recreation area and watched as they gathered together to sing. “Every year on Saint Lucia’s Day pupils from my city’s Swedish school came to our school. A girl, Lucia, led the beautiful procession of young girls dressed in white gowns holding a single candle each. She wore a white cotton gown and a red sash was tied around her waist. On her head, she wore a crown of candles and in her hands she held a single candle. And all along they sang this beautiful song, luciasången. ” Santa Lucia is celebrated all over Italy. Sicilians still commemorate Santa Lucia’s intervention during a severe famine in 1582. Miraculously, ships filled with grain appeared in the harbor on December 13. The people were so hungry that they didn’t take the time to grind the grain into flour but boiled the grains immediately. 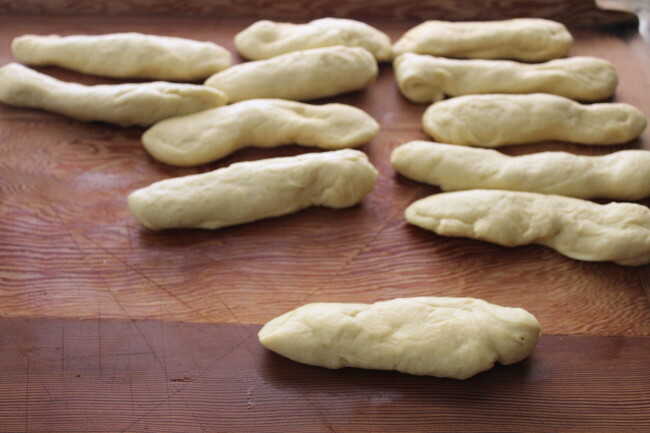 Sicilians refuse to eat anything made of wheat flour for this day, which means forgoing pasta and bread. 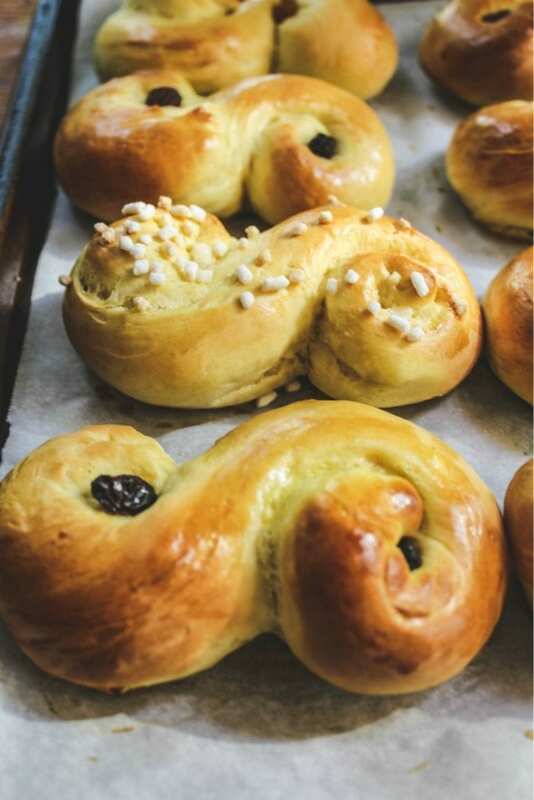 Instead they eat a most popular dish called cuccia which is made with boiled whole wheat berries, ricotta and sugar.”On St. Lucy’s Day in Sweden they eat these lovely saffron buns and in Sicily they eat the wheat berry dish called cuccia. The spiral buns are not that hard to put together. I followed along King Arthur Flour’s tutorial here. I used the buttery brioche dough I just love and added a bit of saffron to it. I happened to have some raisins soaking in grand marnier from another recipe I recently made. You could soak your raisins even in orange juice for about a 1/2 hour before using them for the recipe if you do not have any type of liqueur on hand. The dough is cut into 12 pieces and I weighed them to all be about 90 grams. Once you have them portioned out, you flatten them and them roll them into spirals. They should roll out to be about 13 inch long ropes, and then they bounce back a little. As they describe on King Arthur Flour’s site, you “don’t want to bully the dough.” Let it rest a little covered if it doesn’t seem like it’s ready to roll out. 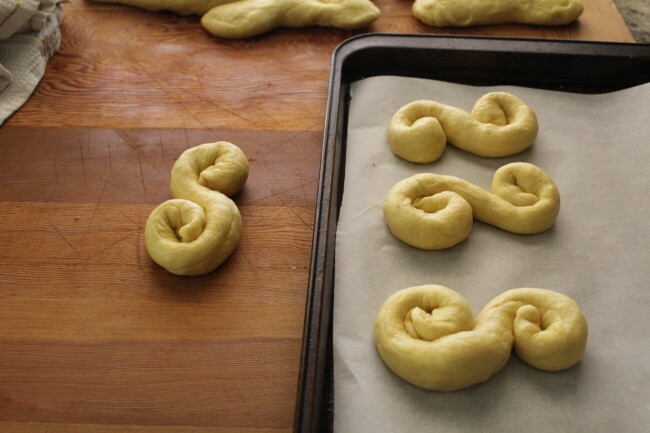 You form them into the spirals and place them on the baking sheet. Leave a little space between them because they do expand a little while baking. Tuck the raisins into each end. (I had some pearl sugar on hand and tossed it on some of the spirals, but I do know that is not traditionally Swedish). After you let them rise for about 30 minutes, you then brush with the egg wash and let them bake. I found this on a lovely Scandinavian blog and it described exactly what I saw and the song they sang. Find out about her story here . Photos and text updated from Dec. 2014. 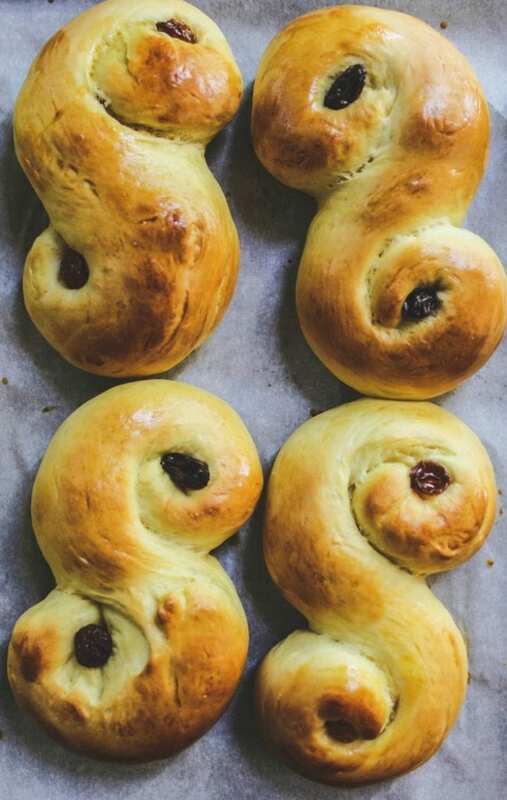 These St. Lucy Saffron Buns (St. Lucia Saffron Buns) are traditionally served for breakfast on Lucia Day, in mid-December. The saffron-hued buns are mildly sweet, but feel free to add a little more sugar if you have a sweet tooth. Decorated with raisins and sometimes just pearl sugar, the perfect addition for your hot latte! 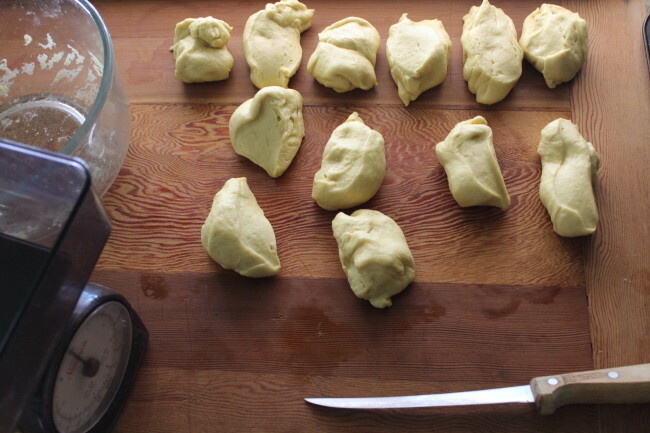 Add 1 Tablespoon of the sugar and the saffron; let stand until foamy (about 5 minutes). Beat in the remaining sugar, eggs and butter. Beat in cooled milk. Gradually add the flour and salt, scraping down side of bowl, until a soft dough forms. 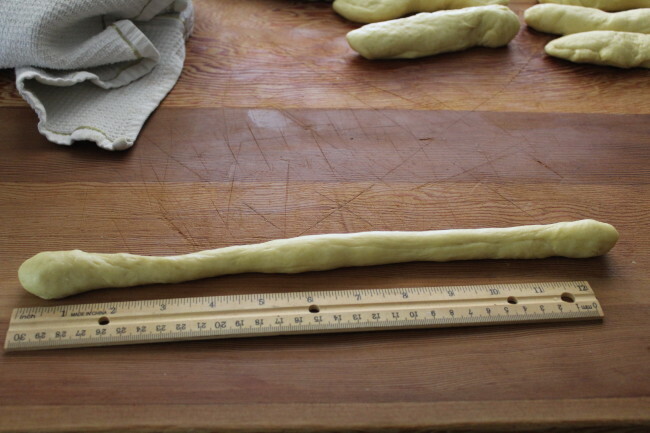 Divide dough into 12 pieces and roll each piece into a 13"-long rope. Form each rope into an S shape and then roll each end into a tight spiral. Place shaped dough pieces 2" apart on parchment paper–lined baking sheets; cover with plastic wrap and let rise in a warm place for 30 minutes. While the spirals are rising, heat the oven to 350F. 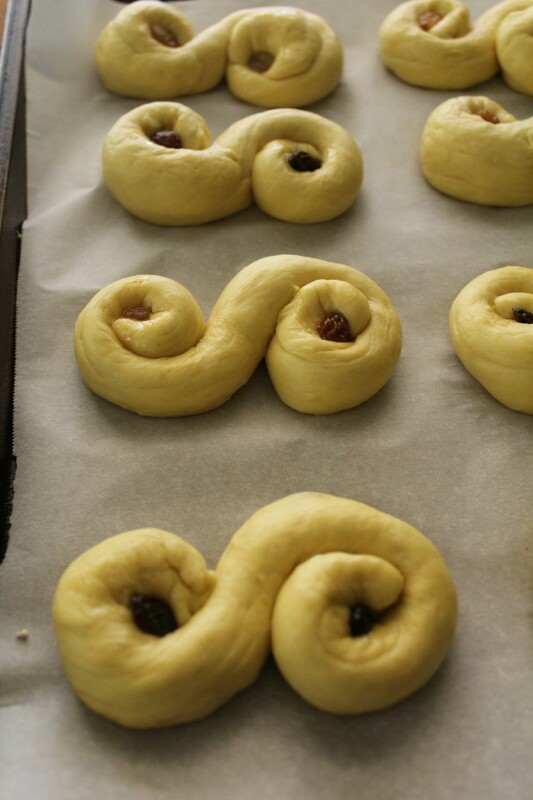 When ready to bake, place a raisin in the center of each of the spirals. Brush on the egg wash. (I happened to have pearlized sugar on hand and tossed some on a few of the spirals, but I know that is not how they are traditionally made in Sweden). Bake until buns are golden brown and cooked through, about 15-18 minutes. Transfer buns to a wire rack and let cool for at least 10 minutes before serving.